Police Officer or Policy Analyst? Hello, I was recently offered a police officer position and I am currently employed with the State as a policy analyst. I started this job as a promotion this week and now I am very torn between being an officer which has been a dream of mine for a long time and continuing a stableand progressive career with DHS. Any advice helps. I have no experience with law enforcement at all. So I am concerned that although this has been an area of passion to me, I might not like it eventually and give up an incredible opportunity with the State. Lastly and most importantly, any advice on how I would approach my brand new employer and tell them that I am leaving? I feel so guilty over this and would be happy to provide further details. What has better benefits and is better for YOU? 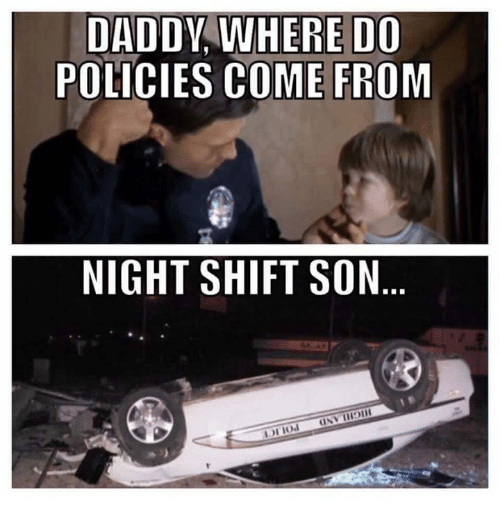 While I have no interest in this point in my life in going back into a uniformed police officer job, I’d still rather do that (or even shove a pencil into my eye socket) before I’d ever want to do any job analyzing policies! Last edited by Kimble; 09-07-2018, 07:09 PM. Do what's best for you and for your family, if you have one. It's your life, your career. Ask yourself what would you find more fulfilling, look at the financial difference/benefits each position offers, and talk it over with close friends/family who know you well. End of the day, do what's right for you. There's no good advice to give. You tell them you are leaving; then they hire someone to fill your spot. Unless you are doing something wrong, there's nothing to feel guilty about. In a matter of weeks they will mostly forget you were ever there. Not to belittle your new job, but where I'm at, analyst positions in my state government are "dime a dozen" assistants to management. They are expected to be jacks of all trades who do all the scut work for managers in just about any area where help is needed. Assuming you state government works the same as mine, my whole point here is, if you were good enough to get the job you currently have, you should be good enough to get reinstated to it again if you find being a cop doesn't work out for you. Look into your state's civil service rules about reinstatement after leaving. I suspect you'll feel a lot better. Someone once said becoming a cop is like getting a front row seat to the greatest show on earth and on top of that, you get paid to go. I think you'll be glad you took the chance. Me three. Case Law too! Will you regret not taking the police officer position? Is it truly your dream? The opinions expressed above are not those of any official capacity or agency. Fix yourself. There are currently 5382 users online. 251 members and 5131 guests.